Don't feel bad if you find the Shih Tzu and the Lhasa apso breeds to be similar. Originally, both breeds were lumped together and classified as "apso." Despite being classified later by the England Kennel Club as separate breeds, the two breeds continued to be confused, even causing some imported Shih Tzu to be mistakenly registered by the American Kennel Club as Lhasa apso. Fortunately, each breed now has distinct a standard that helps to differentiate the two. The Shih Tzu's past and exact ancestry is a bit blurred in history, but what's known for sure is that this ancient breed was cherished as a companion for royal Chinese families from early times. His name means "little lion". The Lhasa apso originated from Tibet, where he was considered a sacred watchdog in the many ancient palaces and monasteries of his homeland. His name derives from the holy city of Lhasa. Despite being similar in many ways, the American Kennel Club has categorized the Shih Tzu and Lhasa apso in two different breed groups. The Shih Tzu is categorized under the toy group, a collection of dogs sharing diminutive sizes. The Lhasa apso instead falls under the non-sporting group, an agglomeration of breeds with different temperaments, sizes and looks. The Shih Tzu and Lhasa apso come in slightly different sizes. The Shih Tzu is a compact dog who shouldn't measure more than 11 inches or less than 8 inches at the withers, according to the AKC. The ideal height would be 9 to 10½ inches and the ideal weight should be between 9 and 16 pounds. The Lhasa apso's height is similar to the Shih Tzu, about 10 and 11 inches at the shoulders with females slightly shorter, according to the AKC. This breed is slightly heavier, weighing between 12 and 18 pounds, according to the American Lhasa Apso Club. The AKC does not set a weight limit in its breed standard for the Lhasa. The Shih Tzu has a domed skull, characterized by a round, broad head. The eyes are large and set wide apart. The Lhasa apso, on the other hand, has a narrow-shaped skull that shouldn't be neither apple-shaped, and unlike the Shih Tzu, is shouldn't be domed. The Lhasa apso's expression is distinguished by the heavy head furnishings, which includes muzzle furnishings and beard. 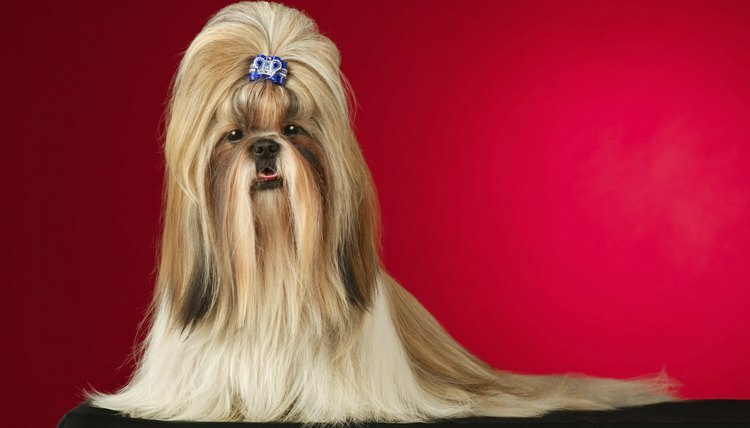 While both breeds are quite demanding in the grooming department, their glorious locks look different, especially when they're competing in the show ring. The Shih Tzu double coat is characterized by long, flowing hairs that may sport a slight wave, but should never be curly. The tresses of these dogs are often kept in order in a full topknot. The Lhasa apso instead, sports a coat made of heavy, straight hairs with heavy head furnishings parted down the middle and falling over their eyes. The Shih Tzu is described as an outgoing, happy and affectionate dog, qualities that make him a wonderful companion. He's also friendly and trusting towards everybody. The Lhasa apso instead retains a regal attitude and the uncanny ability to distinguish a friend from a foe, characteristics that made him an excellent watch dog. He's also slow to mature, independent and quite stubborn by nature, and unlike the Shih Tzu who trusts everybody, he's aloof and loyal and devoted to his family.